Stephen Fry, one of the people on my “I’d love to meet” list, explains what the meaning of life is to him as a nonreligious person. In three minutes. 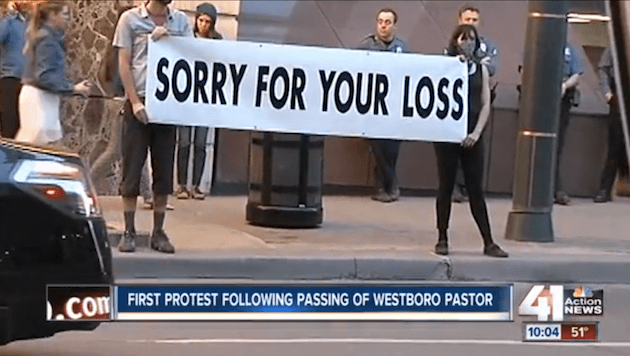 The recently deceased pastor of the Westboro Baptist Church, best know for it’s God Hates Fags protest at funerals met with a “protest” at his own funeral. Your prayer is denied; I a simple human, born of the nature of this earth have more power than any god that you may wish for. My evidence is simple: your strongest prayers do not sway me to acquiesce. Your ignorant praise to human ideology, your worship of thoughtless obedience fails you. Your will shall not be done, but the very rules of common humanity shall prevail. Rise from the shame of mindless obedience, unshackle your thoughts of the Mythic All Seeing Eye. It is a mirage born of ignorance, designed to keep you in thrall.